Vanessa Patel, NP | Gastrointestinal Specialists, Inc.
Vanessa graduated from the Walden University Adult-Gerontology Acute Care Nurse Practitioner program in 2016. 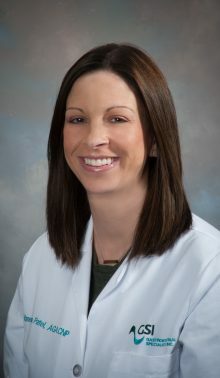 She joined Gastrointestinal Specialists, Inc., in 2017 and is primarily located at Henrico Doctors’ Hospital – Forest where she works closely with Drs. Bradenham, Brand, and Farrell. Immediately before joining GSI, she worked with the hospitalist group for Henrico Doctors’ Hospital. And, prior to becoming a nurse practitioner she worked has an emergency department nurse for 13 years including stints with St. Mary’s Hospital and VCU Health Systems. This time in emergency medicine gave her valuable knowledge, insight and experience with a wide variety of medical conditions. Originally from Richmond, Vanessa currently lives in Glen Allen with her husband, Amit, and two sons. In her free time, she enjoys traveling, going to the movies, shopping and spending time with her family and friends.